H3PO3 is more clearly described with the structural formula HPO(OH)2. This species exists in equilibrium with a minor tautomer P(OH)3. IUPAC recommendations, 2005, are that the latter be called phosphorous acid, whereas the dihydroxy form is called phosphonic acid. Only the reduced phosphorus compounds are spelled with an "ous" ending. The P(OH)3 tautomer has been observed as a ligand bonded to molybdenum. 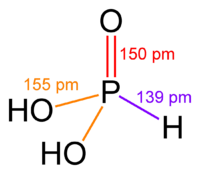 Other important oxyacids of phosphorus are phosphoric acid (H3PO4) and hypophosphorous acid (H3PO2). The reduced phosphorus acids are subject to similar tautomerism involving shifts of H between O and P.
In the solid state, HP(O)(OH)2 is tetrahedral with one shorter P=O bond of 148 pm and two longer P–O(H) bonds of 154 pm. The central phosphorus atom is assigned an oxidation state of +3. The hydrogen bonded directly to the phosphorus atom is not readily ionizable. Chemistry examinations often test students' appreciation of the fact that not all three hydrogen atoms are acidic under aqueous conditions, in contrast with H3PO4. The most important use of phosphorous acid (phosphonic acid) is the production of phosphites (phosphonates) which are used in water treatment. Phosphorous acid is also used for preparing phosphite salts, such as potassium phosphite. These salts, as well as aqueous solutions of pure phosphorous acid, are fungicides. Phosphites have shown effectiveness in controlling a variety of plant diseases, in particular, treatment using either trunk injection or foliar containing phosphorous acid salts is indicated in response to infections by phytophthora and pythium-type plant pathogens (both within class oomycetes, known as water molds), such as dieback/root rot and downy mildew. Anti-microbial products containing salts of phosphorous acid are marketed in Australia as 'Yates Anti-Rot'; and in the United States of America, for example, aluminum salts of the monoethyl ester of phosphorous acid (known generically as 'Fosetyl-Al') are sold under the trade name 'Aliette'. Phosphorous acid and its salts, unlike phosphoric acid, are somewhat toxic and should be handled carefully. ↑ International Union of Pure and Applied Chemistry (2005). Nomenclature of Inorganic Chemistry (IUPAC Recommendations 2005). Cambridge (UK): RSC–IUPAC. ISBN 0-85404-438-8. Electronic version..
↑ Xi, Chanjuan; Liu, Yuzhou; Lai, Chunbo; Zhou, Lishan (2004). "Synthesis of molybdenum complex with novel P(OH)3 ligand based on the one-pot reaction of Mo(CO)6 with HP(O)(OEt)2 and water". Inorganic Chemistry Communications. 7 (11): 1202. doi:10.1016/j.inoche.2004.09.012. 4 core (M = Ni, Pd; Q = S, Se)". Russian Chemical Bulletin. 54 (3): 615. doi:10.1007/s11172-005-0296-1. ↑ Larson, John W.; Pippin, Margaret (1989). "Thermodynamics of ionization of hypophosphorous and phosphorous acids. Substituent effects on second row oxy acids". Polyhedron. 8: 527–530. doi:10.1016/S0277-5387(00)80751-2. ↑ CRC Handbook of Chemistry and Physics (87th ed.). p. 8–42. ↑ Novosad, Josef (1994). Encyclopedia of Inorganic Chemistry. John Wiley and Sons. ISBN 0-471-93620-0. ↑ Gokhale, S. D.; Jolly, W. L. (1967). "Phosphine". Inorganic Syntheses. 9: 56–58. doi:10.1002/9780470132401.ch17. ↑ Organic Labs. Product label for 'Exel LG,' Retrieved April 9, 2007. ↑ Yates, a Division of Orica Australia Pty Ltd. “MSDS ('Yates Anti Rot Phosacid Systemic Fungicide').” Version 1. SH&E Shared Services, Orica. Homebush, NSW (Australia): April 4, 2005 (retrieved from www.orica.com April 9, 2007). ↑ US EPA. “Fosetyl-Al (Aliette): Reregistration Eligibility Decision (RED) Fact Sheet.” Office of Pesticide Programs, US EPA. Washington, DC (USA): 1994 (retrieved from www.epa.gov April 9, 2007).